This large neighborhood park has a mulch-cushioned playground, tennis courts, a basketball court, a soccer field, and ball fields. 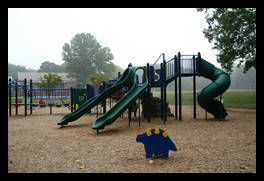 The playground is very nice. It was re-done in 2006. 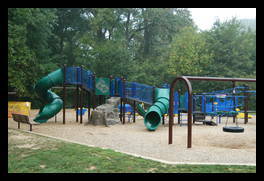 It has lots of slides and swings and good places to climb. There is a wobbly bridge, which is really some foot pads connected by chain, this provides a nice challenge. There is also a play train to climb on and something to hang from and slide. The playground will be in the sun in morning and afternoon. By late afternoon, it should get some shade. 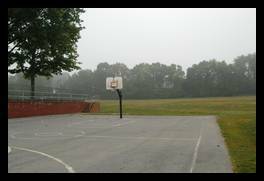 The parking lot is on the opposite side of the park from the playground so you will have to take a short walk to get there. 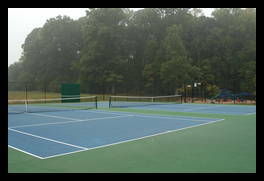 There are two tennis courts and a tennis practice wall as well as a basketball court. There are two ball fields and a soccer pitch, however, the soccer pitch and the outfields of both ball fields share land, so you can't use them at the same time. 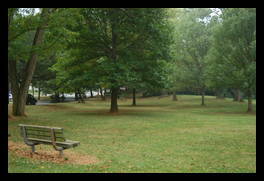 Next to the parking lot is a shady/grassy area with some benches, it is large enough to run around in or bring a blanket and have a picnic lunch. There aren't any picnic tables at this park. The back part of the park has a large wooded area, I didn't see any trails going through it though. 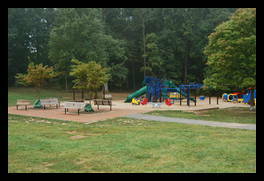 This park is at the site of the former Ayrlawn Elementary school. The school building is still there, but is used by the YMCA so it isn't public access. I went there during the day and almost all the parking spots were taken, even those reserved for park patrons, ther wasn't anyone at the park so it seems people at the YMCA are using spots they shouldn't. Spiral slides 1 good Covered! merry-go-round 1 very good This is larger than ones found in most parks. Things to bounce on 2 good A dinosaur and a motorcycle. Bridges 2 good One wobbly one, and one angled upward. Parking yes good Parking lot shared with the YMCA, but some spots are reserved for park use.